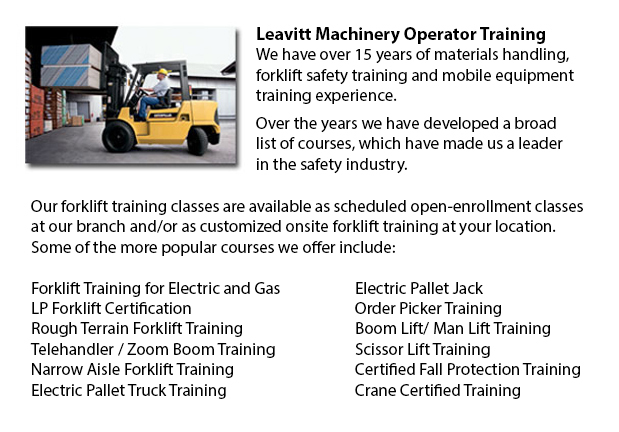 Edmonton Forklift Training Programs - If you are searching for a job as a forklift operator, our regulatory-compliant forklift training programs offer excellent instruction in various styles and types of lift trucks, classes on pre-shift check, fuel types and handling of fuels, and safe use of a lift truck. Hands-on, practical training helps individuals participating in obtaining essential operational skills. Course content covers existing regulations governing the use of lift trucks. Our proven forklift programs are intended to provide training on these types of trucks: counterbalanced forklift, powered pallet trucks and narrow isle forklift. While the lift truck is in operation, do not raise or lower the forks. Loads should not extend over the backrest. This is because of the risk of the load sliding back towards the operator. Check for overhead obstacles and ensure there is adequate clearance prior to lifting a load. Stay away from overhead power lines. Once the load is lifted straight up, tilt it slightly back. While the load is raised the forklift will be less stable. Make sure that no pedestrians cross below the elevated fork. The operator should not leave the forklift when the load is lifted. While handling pallets, forks must be high and level enough to go into the pallet and extend all the way underneath the load. The fork's width should provide even weight distribution. Chock the wheels and set the brakes prior to loading and unloading the truck. The floors should be strong enough to support the weight of both the load and the forklift. Fixed jacks could be installed to support a semi-trailer which is not coupled to a tractor. The entrance door height should clear the forklift height by at least 5 cm. Mark edges of docks, rail cars or ramps and avoid them. If there is not proper ventilation into the forklift, do not stay in there for extended periods. The interior of the truck must have enough lighting and be obstruction free. Check the flooring of the forklift cab for holes. The installation of nonslip material on the floor will help avoid slipping. Clear whichever obstacles from dockplates and docks and make sure surfaces are not wet or oily. Forklifts must not be utilized to tow or push other forklifts.